Two ramps connecting to Citylink north on alignment similar to Reference design but lowered to emerge west of a deviated Oak St as in Mr Higgs plan. Tunnel spoil to be used to re-establish Ross Straw Field approx 5-10 metres higher. Vent shaft to be just east of rail line at crest of hill -100 metres from mouth. Ormond Rd ramp to remain subject to addition of an on-ramp to tunnel but not Citylink. Two lane Western link section to diverge from Reference design alignment and surface west of Upfield rail line just south of Arden St. Melways 2A C8 – currently rail siding. The viaduct would rise to pass over the various rail assets and run above the rail yards cross Dynon Rd and connect to planned northern arm of the WestLink preferred design. 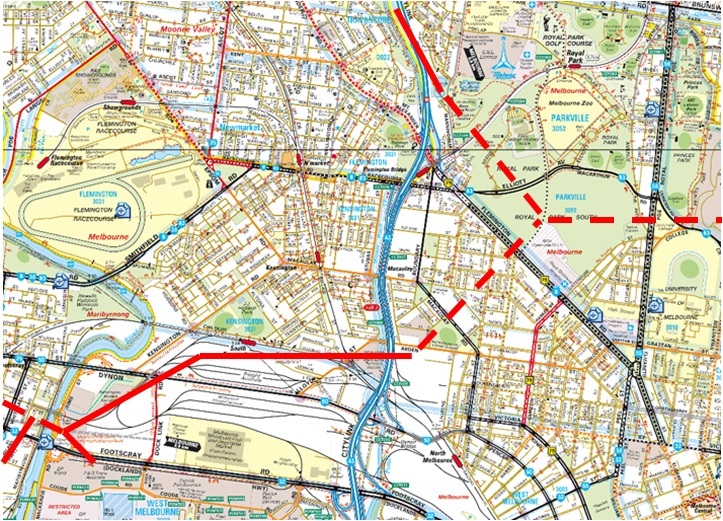 Route from EWL to Westgate/ Geelong freeway via Docklands Highway and proposed Westgate Distributon. The argument that Part B is essential and Part A won’t be effective without it is negated by the fact the Government is only funding Part A at this stage – hence they believe it will work. This looks like the way to go. I like it, the only problem is it would be massively more expensive with a lot more tunneling, and a Y freeman interchange entirely underground. I suppose it could he done….